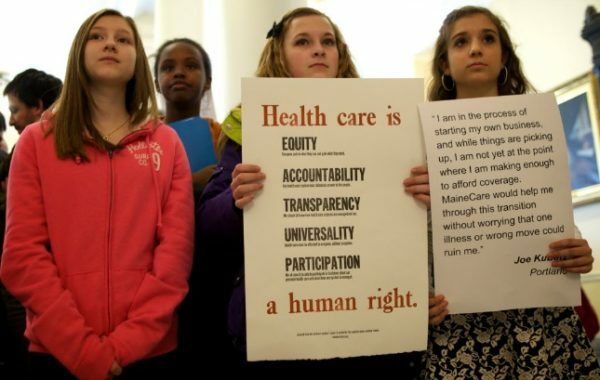 Young demonstrators hold signs at a rally and lobby day organized by the Maine Peoples Alliance at the State House in Augusta around the issue of Medicaid expansion, Jan. 8, 2014. The parties on both sides of the debate over expanding Medicaid eligibility in Maine dug new trench lines Wednesday, as the state careens toward a referendum in November that some see as a potential national barometer on health care and conservative principles. The question of whether to expand the taxpayer-funded health care system here comes to the Nov. 7 ballot by citizen initiative after at least six legislative expansion attempts under Republican Gov. Paul LePage have failed. Maine’s referendum looked like it could have been a moot point after the election of Republican President Donald Trump, who promised during his campaign to repeal the Obama-era Affordable Care Act and cancel the incentives for states to beef up their Medicaid programs. However, Trump’s and Republicans’ resounding failure to achieve that goal, so far, has turned the magnifying glass toward the Pine Tree State. The volleys in what is sure to be a bruising campaign have been coming sporadically but will intensify following the Yes on 2 campaign’s official launch Wednesday, with events in Bangor and Lewiston. Both cities lie in Maine’s more conservative 2nd Congressional District, where the question will live or die. Maine Equal Justice Partners Executive Director Robyn Merrill, who will be one of the public faces of the campaign on behalf of expansion, set the theme we’ll be hearing a lot about between now and November: A “yes” vote will extend health insurance to at least 70,000 Mainers and provide a much-needed financial boon to Maine’s rural hospitals and health care clinics. Another powerful voice who will be dealing with the question of expansion in other channels, most notably congressional deliberations, will be Sen. Susan Collins, R-Maine, who has not said whether she supports the measure but has cited her concerns that cutting Medicaid would hurt rural hospitals and clinics as a major reason she is one of three Senate Republicans who blocked the most recent congressional repeal effort. Collins has said that if Maine does expand its Medicaid program, it should model Indiana, where recipients are required to keep savings accounts to help pay for their medical costs. Countering expansion proponents will be many Maine Republicans, most notably LePage, U.S. Rep. Bruce Poliquin of the 2nd Congressional District, and Brent Littlefield, a behind-the-scenes political strategist who has long worked for LePage and Poliquin. Littlefield and the Welfare to Work Political Action Committee spearheaded the opposition Wednesday in a news release. Their arguments are the same as they’ve been for years: “Able-bodied adults” should not be eligible for taxpayer funded health care and expansion would be financially ruinous for Maine in the long run. Another familiar argument that will continue is that expansion drains resources for programs that support some of Maine’s most needy people, though expansion proponents call that a false equivalency. “This makes it even more difficult for the state to take care of the hundreds of cognitively and physically disabled Mainers who have been languishing on waitlists,” said Rep. Heather Sirocki, R-Scarborough, a member of the Legislature’s budget committee who has long been a staunch expansion opponent. A major challenge for both sides will be turnout in an off-year election when targeted campaign messaging and get-out-the-vote strategy will have a much greater impact on the outcome. To read more about today’s Maine political news, go to Daily Brief by clicking here. To have the Daily Brief delivered daily to your inbox, click here.